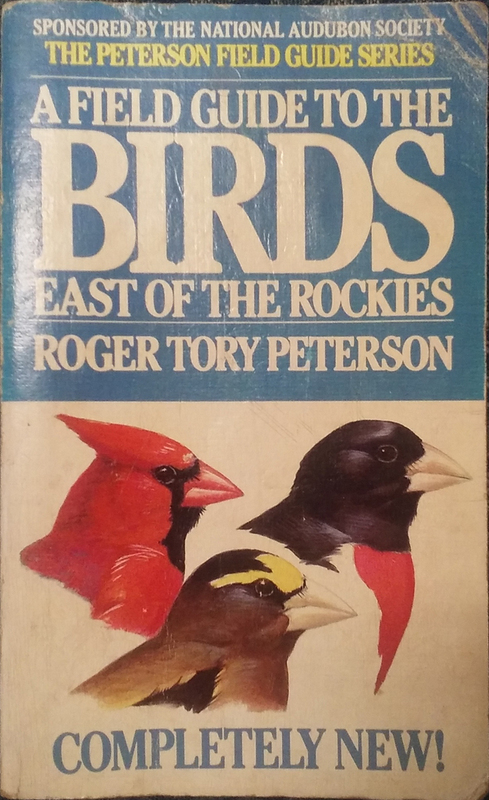 After over a decade, I was finally able to recover my 4th edition of A Field Guide to the Birds East of the Rockies, by Roger Tory Peterson. It was given to me by an aunt soon after I had my spark as a high-school senior to be a birdwatcher. Years ago, I lent the guide to a friend with whom I almost immediately lost regular contact with. I purchased a 5th edition, after making do with my Stokes guide for a time (which is fine, if you like photo-based vs. illustration based guides – a discussion for another time). The cover of my Peterson’s 4th Edition with the 3 (sort of now formerly) finch heads. Since this edition, cardinals and grosbeaks are still “together” (family Cardinalidae) but separate from finches and sparrows (family Emberizidae). Back in 1980, they were all in family Fringilidae. Taxonomists live and die by their Latin, of course. Its recovery also includes attendant checklists and notes, some made in the margins of this well-worn volume. But with it came a mystery! I have “Scrub Jay” noted, seen in Montana. Why is this significant? At the time I “lost” the guide, I had not yet seen a Florida Scrub-Jay. It is also important to note that the 4th edition was published in 1980. As many of my birding readers know, bird taxonomy (the practice and science of classification) is in a constant state of flux. Back in the early 1980s, birds such as the Baltimore and Bullock’s Oriole were lumped (or re-lumped) into “Northern Oriole” and there was only one “officially” recognized species of Scrub Jay on the continent. Since then, the Scrub Jay has been split and/or redefined at least twice. What to make of this simple note of a Scrub Jay in Montana in 2001? The two most likely candidates are the California Scrub-Jay and Woodhouse’s Scrub-Jay; both were formerly part of the “Western Scrub-Jay” prior to a taxonomic split this year. In 2001 the Western Scrub-Jay was already a distinct species from the Florida and Island species, but my 1980s era guide didn’t tell me that. From left: Woodhouse’s Scrub-Jay. Photo: FLPA/Alamy; California Scrub-Jay. Photo: Lou Orr/Great Backyard Bird Count (Not my photos). The problem is larger than this, though. For either “probable” species of scrub jay, neither is terribly likely in the places I visited back then. Our track took us from Fort Benton, along the Missouri River to Great Falls, south to Helena and eventually to Three Forks. According to eBird (which risks becoming the “Wikipedia” of the bird-sighting world, I realize) there are no reports of a scrub jay within hundreds of kilometers of my locations. The closest mapped species is the California Scrub-Jay, seen near the Thompson Falls Reservoir. But it’s the least likely given the habitat. The closest Woodhouse’s Scrub-Jay is mapped near the Cress Creek Nature Trail in Idaho, well to the south. Unfortunately I did not make any further notes on this sighting (or if I did, they are lost to both my memory and physically). Was the bird or birds I saw pale or strongly colored? I want to say pale, but memory is notoriously faulty and I can’t rely on a decade-and-half-old recollection. Realistically, this doesn’t mean a whole lot in practical terms. It’s one “count” on my life-list I can’t really add. The best I can do is note, in today’s taxonomy, “Woodhouse’s/California Scrub-Jay” and leave it at that. It’s an almost imperceptible blip in the vast store of bird sightings both within and outside of eBird. This illustrates the importance of notes and photographs. It hasn’t really been until my adoption of eBird to track my sightings and my use of a camera that I’ve had any semblance of good record-keeping with my birdwatching activities (and even still, I could do much better). I am not by nature an organized person. For these and other past records, they’ve passed on into memory and thus into obscurity and I’m left with a handful of sightings that will be best served as personal myth.